Jamie Wilson has reached his first Cuestars final at his 66th attempt. The 15-year-old talent, from Havant, ended his eight-year wait in the fourth leg of the under-21 gold tour in south London. 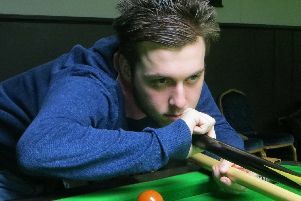 Wilson finished second in his round-robin group at Frames Sports Bar, Coulsdon, and beat fellow England international Oliver Sykes 2-1 in the last-eight. He then edged Sykes’s Chandlers Ford clubmate Steven Hughes 2-1 in the semi-finals. And he was one shot away from taking the crown. 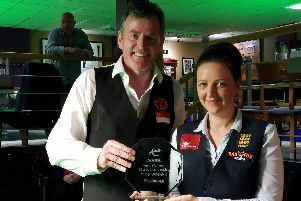 Wilson, now second in the rankings, lost 2-1 on the final black to Basingstoke star Mickey Joyce after leading by 27 points with one red left in the decider. Elliott Weston, who beat rankings leader Bradley Cowdroy 2-1 in the group stages, was knocked out 2-0 by Joyce in the last-eight. Owen Jenkins retains the lead in the bronze tour rankings despite a 2-0 quarter-final defeat by Dylan Smith, from Tunbridge Wells. Third-placed Thomas Sharp lost in the semis for the fourth time this season. He went down 2-0 to Londoner John Donovan, the eventual tournament winner. Daniel Walter was defeated 2-0 by home player Jack Mullen in the quarter-finals. On the silver tour, Harry Wilson made a last-eight exit after beating the Essex-based rankings leader Louie Leighton in the group stages. Appearing in his second semi-final this season, Will Forster was knocked out 2-1 by tournament winner Riley Ellis, from Wiltshire. For more information about the event sponsors, visit www.framessportsbar.co.uk and contact Mr Gold viajs.gold@hotmail.co.uk or ring 07930 355677. Meanwhile, Samuel Laxton responded in the best possible way to failing to qualify for the knockout for the first time in his 14th Cuestars tournament. The 13-year-old knocked in the highest break of 29 and won the six-man round-robin group to move up to fourth place in the Monday Junior Snooker League at Waterlooville Sports Bar. Jenkins won the top group in the Wednesday Junior Snooker League and leads division one by one point from Harry Wilson and Billy Reid. And tactical play helped Keira Hiscock win the 10-strong round-robin group in the Junior Pool League. She extended her lead at the top of division one to 10 points over defending champion Jayden Brookes. The much-improved George Barber moves into second place in division two, 15 points behind six-year-old Jayden Hickley. Waterlooville Sports Bar hosts the fourth leg of the Cuestars seniors (40+) tour on Sunday at 10.30am.